This article is about the enemy in Cath Bedraud. For the version met in Coldharbour, see Angof the Undying. 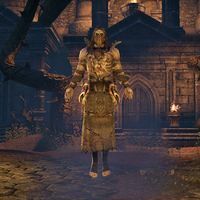 Angof the Gravesinger is a Reachman necromancer and the leader of the Bloodthorn Cult. He plans to conquer all of Glenumbra. You must fight him in the final chamber of Cath Bedraud. Similar to the Bloodthorn zombies, Angof is in a painful state of undeath himself, with twisted vines emerging from his back. In death, Angof is sent to Coldharbour, where you will encounter him as Angof the Undying. Once Gloria Fausta performs the blood ritual on a captured werewolf, you will witness Angof raising Faolchu from the dead. Vision of Angof: "Now the legendary werewolf lord shall fulfill Molag Bal's true purpose. Arise, minion. Arise from the dead!" Vision of Faolchu: "I serve no one, Reachman!" Vision of Angof: "Serve or suffer, cur. I've bound you to my will. Glenumbra's destruction is your only goal." Vision of Faolchu: "Today I submit to you, Angof. But one day soon I will rip out your heart and eat it whole." Vision of Angof: "Empty boasts from Molag Bal's newest slave. Come, Faolchu. We have business to attend to." The vision will fade and the werewolf will mock you for Duke Sebastian getting infected. During your assault on Camlorn, you can witness Angof's projection talking to Faolchu. Faolchu the Reborn: "Begone, Angof. I did your bidding. This city is mine now." Vision of Angof: "You are still my creature, slave. I made you." Faolchu the Reborn: "I devoured Camlorn. All of Glenumbra will be mine!" Vision of Angof: "Vain creature. The Lion Guard stands at your door. You have failed." Faolchu the Reborn: "They are weak and I will crush them. Camlorn is mine!" Vision of Angof: "You will see, beast. You will see." When you enter his sanctum in Cath Bedraud, Angof will be waitng for you. Angof the Gravesinger: "So you are the vain fool who seeks to pry Glenumbra from my grasp." Angof the Gravesinger: "After I kill you I shall raise you up and make you my slave!" This page was last modified on 6 February 2019, at 05:40.